Today in the Lounge Nick talks with Richard Anuszkeiwicz the Executive Director of the Kitchen and Bath Division for Alt Breeding Schwarz Architects, Chuck Wheelock of Wheelock Design, and Brad Egan of Niagara Conservation live from KBIS Day 2. 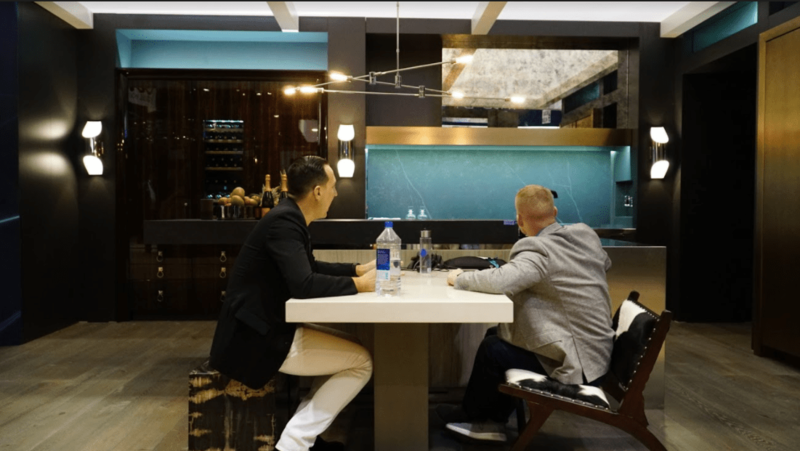 Richard and Nick discuss how he skyrocketed his career in design in less than 10 years and about his new project with Liebherr this year at KBIS. Chuck and Nick talk about Chuck’s business and his relationship with Perlick. Nick and Brad chat about the current water crisis and what Niagra is doing to help. Richard Anuszkeiwicz was born and raised in Pittsburgh, Pennsylvania. His favorite vacation was last year when he traveled with a continuing education course to the Honolulu Design Center in Hawaii. He loves Tom Ford. Favorite movie? Nocturnal Animals. Beer, Wine, or Cocktail? Richard loves cocktails, either a gin and tonic or vodka soda. Richard was very creative as a child. He went to school for Residential Design at Virginia Tech. Early on in the program, he was introduced to kitchen and bath. He attended KBIS Chicago as a sophomore in college and ever since, he’s been a loyal KBIS attendee. This gave him his “aha!” moment to work more with kitchens and baths. Richard encourages students to get themselves to a trade show and just shake some hands. He says that ultimately every opportunity he’s gotten has been because he met someone along the way. Richards tells us knowledge is power so don’t be afraid to ask questions! Richard graduated in 2010 and started with a Design-Build firm in Virginia. Right off the bat, they opened a brand new showroom. His vision was focused on perfecting the kitchen cabinets, the ceiling details, and the windows to go along with it. He was there for three years and then went to Alt Breeding Schwarz Architects where he is currently the lead for their casework and cabinetry division. In 2013, Richard launched his own lifestyle brand after being mentioned in NKBA’s 30 under 30 contest. 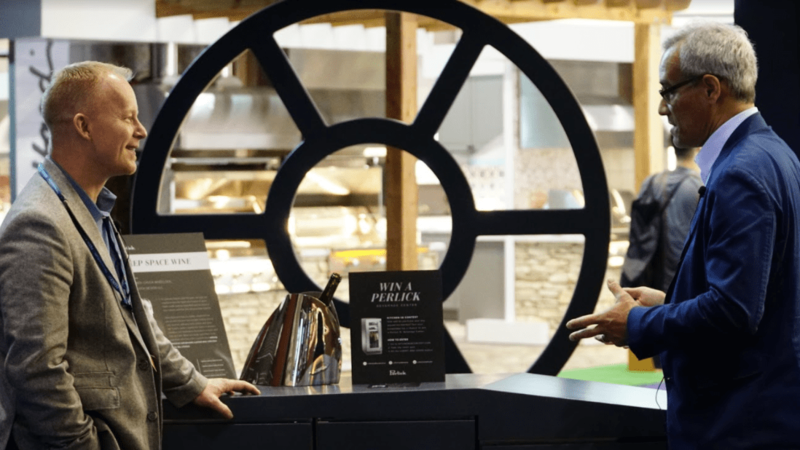 He wanted to bring new products and ideas to the market, empower the next generation, and change the general consumer’s mindset on what a kitchen could or should be. He started to develop a CEU entitled, Fashion-Forward Thinking; a way to look at the world you, be inspired and use those ideas to inspire your work. Richard says design is an experience, he doesn’t sell products, he sells a lifestyle. Richard considers himself to be a chameleon for his clients, taking their raw ideas and enhancing them in every which way imaginable. Richard learns every day and his job is a passion. At KBIS 2018 Richard helped design the Monolith Inception (pictured above) with Liebherr. 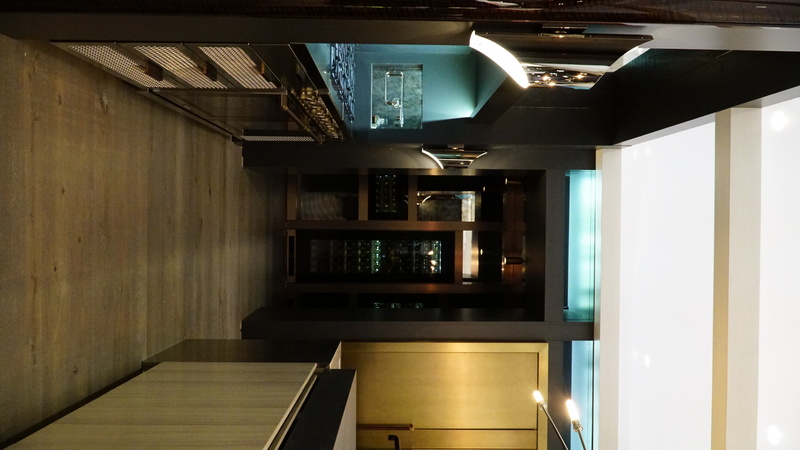 In a luxury market, you must be mindful of the finishes and how they function in the space. The table that Nick and Richard are sitting at is actually integrated into the island. Liebherr launched their new column series under the name Monolith. Monolith Inception is a multi-surface island with a table top, primary sink area, a work surface, and a banquette. This island is all carved from one piece of stone, hence the name. This space also includes a few other features such as the integrated armoir, which is a 30-inch refrigerator and 24-inch freezer, and the range wall. The range wall has every material from stone to wood. In the drawers you’ll find a pop of red so you’ll know it’s part of the Richar Living Collection. 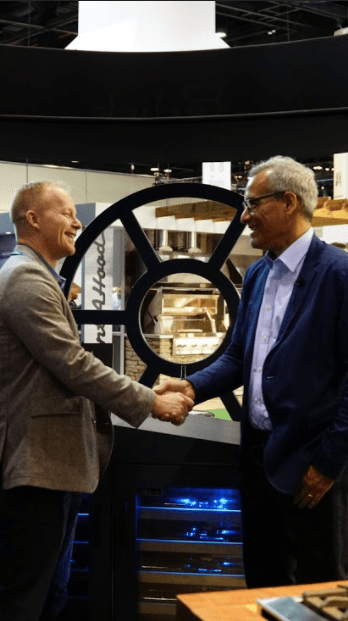 Other vendors that helped create the Monolithic Inception include Bentley, Superiore, Dekton USA, Grothouse Lumber Wood Tops, and Bridget Beari Designs. To connect with Richard visit www.richarliving.com. To learn more about Liebherr visit www.liebherr.com. Chuck Wheelock is the Founder and President of Wheelock Design a kitchen design firm that makes their own cabinets out of Old Greenwich, Connecticut. 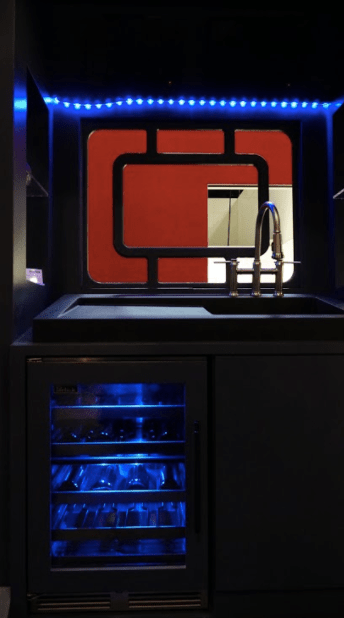 He designed the wine display at Perlick booth for KBIS 2018 after asking Perlick directly if he could. His shop made the diamond-shaped island. The kitchen was designed by Erin Belazari. Perlick has their products in almost every bar in the industry and has been around for 100 years. As inspiration for their booth, Chuck thought about what’s to come in the next 100 years. Chuck was fascinated by all of the wellness and sustainability talks going on throughout KBIS. He says that complex geometry is going to be a trend in years to come for kitchens because of our new 3D technologies. To connect with Chuck visit www.chuckwheelock.com. To learn more about Perlick visit www.perlick.com. Brad Egan is the Director of Marketing for Niagara. Niagara wanted to draw people in with bold colors, looks, and graphics. Their goal is to advocate the message of water conservation as we deal with the worldwide water crisis. Niagara has had the lowest energy flushing toilet for over decade. 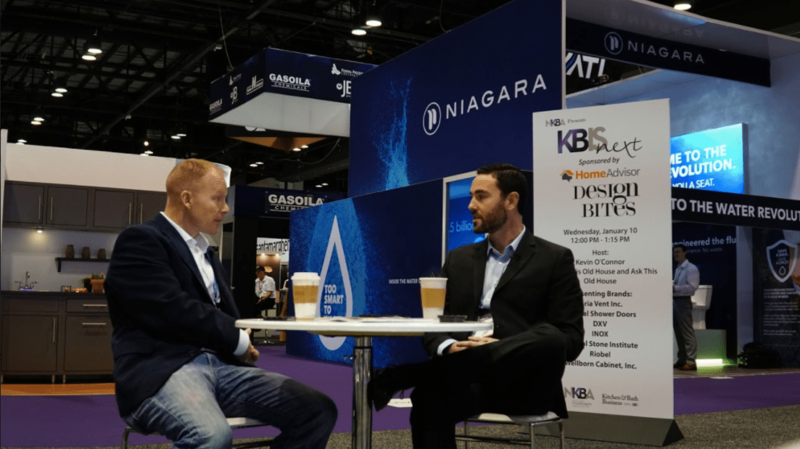 At KBIS they connect with the everyone from building owners to design professionals to consumers. Niagara has reengineered their technologies to perform better than the others while not sacrificing the user experience. For showers this means great water pressure, it’s toilets that perform every single time, and faucets that use less water. Niagara work with distributors throughout the United States, Central America and the Middle East. You can find them with Ferguson Supply, Willmar, and Home Depot. You can get the entire product for $149 at Home Depot. The Chaise Lounge will be at The Dallas Market for the first time on Jan 17-23. Benjamin Moore Check out the interview on Facebook Live with a design rep at KBIS! Here in The Lounge, Becca is in charge of 'all things podcast' from management, marketing, branding, graphic design, social media, event planning all the way to managing our interns. Her background is in art and design but that didn't stop her from diving headfirst into the unfamiliar worlds of business, marketing, interiors, and podcasting. Growing up in a small, coastal, New England town, Becca has now been in Denver for five years and doesn't plan to leave the mountains and sunshine anytime soon! On the weekends you can catch Becca hiking, skiing, dreaming about the beach or enjoying the local food, art, and shopping. If you have any questions about the show, Becca is your girl.